Fourth Row Center: Film Writings by Jason Bailey: On DVD: "The Willie Nelson Special"
On DVD: "The Willie Nelson Special"
The Willie Nelson Special (given the amended title The Willie Nelson Special—with Special Guest Ray Charles for this DVD release) catches the iconic country troubadour in a 1985 performance at the Austin Opry House. He was riding high at this point in his career, thanks to his recent pop radio hit “To All The Girls I’ve Loved Before” (a duet with Julio Iglesias), his appearances on the “We are the World” single and as part of the country supergroup The Highwaymen, and his organization of the first Farm Aid benefit. Nelson and his band (with the help of guitarist Jackie King) perform a relaxed, intimate set of standards and Nelson’s hits. The real attraction, however, is the appearance by Ray Charles (I can’t help but think that this disc’s release falling less than a month before the arrival of the new Willie Nelson and Wynton Marsalis Play the Music of Ray Charles can’t be a coincidence). Ray joins Willie and the band early in the show, following an opening sequence that accompanies “On The Road Again” with credits and off-stage footage, bound together by a seemingly endless array of cheesy 80s video effects and wipes. Next is a lovely performance of Willie’s 1982 cover version of “Always on My Mind,” and then Ray joins Willie and the band on stage. The two men have a clear and loving rapport, established immediately after Ray’s entrance when Willie tells a funny story about Ray’s keen chess-playing abilities (echoing an anecdote told by Bill Cosby on his Live at Madison Square Garden album); their playful, enjoyable interplay is a treat. Charles sticks around for six numbers, a good half of the program’s running time, so this is less of a traditional “guest star” spot and more of a full-on collaboration. As with Nelson’s recent pairings with jazzman Marsalis, Nelson and Charles meet in the middle, between his country sound and his partner’s soul stylings, to play some blues. After a brief improvised instrumental break, their first number is a bluesy take on the jazz standard “Angel Eyes.” It’s quite good, a marvelous mix of Ray’s playing and Willie’s unique vocalizations. Nelson then casually joins Charles at the piano for a full-on vocal duet, a rousing rendition of “Seven Spanish Angels.” Their take on “I Can’t Stop Loving You” is also excellent, but the highlight of the set may be their performance of Ray’s signature tune, “Georgia on My Mind,” which wonderfully mellow, but goes out strong with a good rave-up at the end. Glimpses of rehearsal footage and interspersed throughout the special, including the entire first half of their closing number, “Mountain Dew,” a grooving crowd-pleaser. The special’s biggest problem, however, is that Charles’ songs are undoubtedly the highlight, but once it builds to them, there’s nowhere left to go. There’s nothing wrong, per se, with the second, Ray-free half of the show, but it’s a bit of a comedown after the heights of the Nelson/Charles duets; the special would have benefitted greatly from a re-edit that shuffled the Charles material to the second half. There’s still good stuff after he’s gone, though. The nimble fingers of guitarist king make for particularly jazzy renditions of “My Window Faces South” and “There Will Never Be Another You,” while the performance of “To All The Girls” gets a giggle from the audience when Nelson begins the second verse, sung on the record by Iglesias, with a quick impression of the Spanish crooner. “Who’ll Buy My Memories” and “Without a Song” are also well-performed, and the quick video excursion to visit old friends in Willie’s hometown of Abbott, Texas is a nice inclusion. But while the final number, “Whiskey River,” is perfectly adequate, it’s not the kind of barn-burning closer you might hope for. For fans of Willie and Ray, this one is a no-brainer; their duets are terrific, and both musicians are in fine form. But the special is something of a mixed bag (thanks primarily to its odd organization), and the audio and video presentation, while not necessarily bad, are somewhat underwhelming. Those minor fumbles, along with the lack of any supplementary material, makes The Willie Nelson Special one for the rental queue. 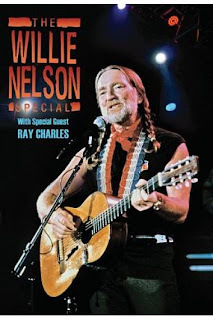 "The Willie Nelson Special" was released on DVD on Tuesday, September 22nd. In Theaters: "The Invention of Lying"
In Theaters: "Brief Interviews with Hideous Men"
In Theaters: "A Serious Man"
Bookshelf: "The Marx Brothers as Social Critics"
In Theaters: "Capitalism: A Love Story"